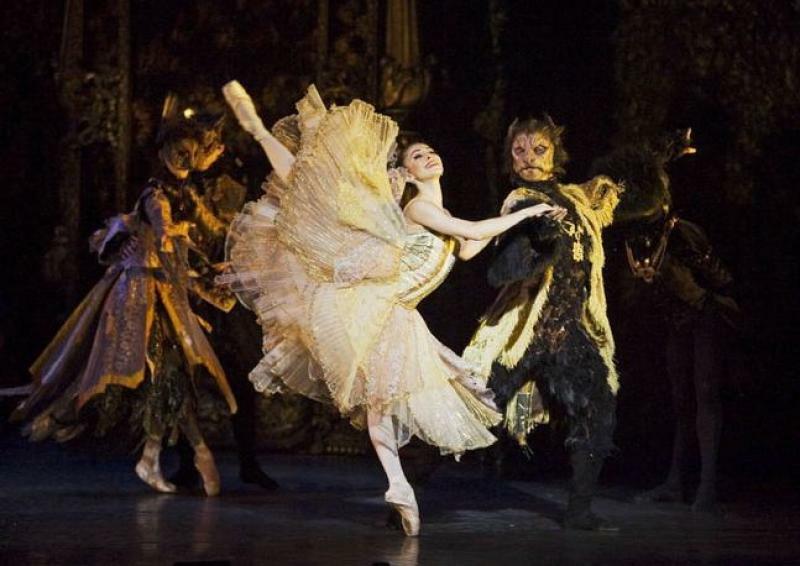 “A tale as old as time” certainly rings true in Birmingham Royal Ballet’s faithful interpretation of Beauty and the Beast. The story tells of Belle, a young woman who becomes entrapped in the house of a cursed beast who she eventually falls in love with. Drawing on the natural imagery in the gothic myth, this version was as bewitching, decadent and heartfelt as you would expect. Opening with Belle (played by Elisha Willis) perched a top a ladder reading a book from a towering book case, the ballet endeavours to enchant from the start. Belle’s youthful energy shines through as she tiptoes and twirls with wistful innocence and Willis does well to maintain the delicacy of the character within the confines of fairytale stereotypes. In contrast we see The Beast (Tyrone Singleton) in his original human state transform from a gallant hunter to a tortured creature, his trademark leaps taking on more ferocity as the story unfolds. Singleton dazzles in this role, managing to capture both the aggression and vulnerability of the Beast through nuanced choreography. Together, Belle and The Beast work effectively, her fragility drawing out his with endearing softness, building chemistry along the way. Willis and Singleton weren’t the only Belle’s of the ball however. All of the cast delivered their roles assuredly. Belle’s vain sisters (Angela Paul and Samara Downs) competed for attention through melodramatic pouting and posturing whilst their Merchant father (Michael O’Hare) meekly obliged to any confrontation. A couple of humorous additions in the form of a grouchy Grandma (Marion Tait) and a snout nosed blundering love interest (Monsieur Cochon, played by Jonathan Payne) for the sisters provided light relief from the theatrics. Those used to the Disney characterisation of dancing teapot and candelabra would be disappointed; the cursed inhabitants of The Beast’s castle this time morph into an array of scurrying creatures, adding to the offbeat gothic charm of the show. It would be easy to write Beauty and the Beast off as a simple fairytale but the rich use of animal symbolism attached to both human and beast does provide food for thought. At times the human characters from pot bellied Monsieur Cochon to the squabbling sisters revealed more of an animalistic nature than the cursed creatures. Even amongst the most feral of the creatures, the movements were delivered with grace and ethereal energy from the crew of leaping rats, flock of glittering birds and in particular Yaoqian Shang’s feline flicks as vixen turned wild girl . One of the biggest hits of the evening came not from the dancing, but from the set design, masterminded by Philip Prowse. Breathtakingly intricate, the set would transform from simple fineries of the Merchant’s house to the gloomy opulence of The Beast’s castle with the help of retreating ivy covered walls and moving taxidermy. Hovering crockery, self lighting candles and hugging chairs merely added to the magic unfurling. Costumes too were equally as elaborate, pairing furs and feathers with glitter and lace. Accompanied by live orchestral music courtesy of the Royal Ballet Sinfonia, the elements came together in beguiling style. Birmingham Royal Ballet’s Beauty and the Beast succeeds as a entertaining spectacle for all the family. From the characterisation to the costumes it is a conscientious retelling, the gothic quirks keeping us enthralled. For adults perhaps, the stereotypical gender portrayals might wear thin towards the end of the show but if you’re looking for a happy ever after, this show gives you just that. Beauty and The Beast is touring until throughout November: click here for more information.